Practice Cloud Computing questions and answers for interviews, campus placements, online tests, aptitude tests, quizzes and competitive exams. This set of Cloud Computing Multiple Choice Questions & Answers (MCQs) focuses on “Porting Applications”. 1. Which of the following vendor is offering optimization appliances for VMware infrastructure? Explanation: Most virtual appliances are used to run a single application and are configurable from a Web page. Explanation: Cloud computing is the major reason for the interest in them and for their adoption. Explanation: Other methods may be needed to make applications easily portable. 4. The __________ solution creates a virtual application appliance as an architectural layer between the Windows or the UNIX operating system and applications. Explanation: The running application in AppZero changes none of the registry entries or any of the files on the Windows Server. Explanation: VMs running applications have sufficient flexibility to give acceptable distributed WAN application performance. 6. _______ creates a container that encapsulates the application and all the application’s dependencies within a set of files. Explanation: Dependencies include DLL, service settings, necessary configuration files, registry entries, and machine and network settings. 7. Which of the following layer serves as the mediator for file I/O, the memory I/O, and application calls and response to DLLs? 8. Which of the following application delivery platform’s main focus is on desktop installations? Explanation: Installations can be done over the network after the AppZero application appliance is installed. 9. Which of the following is the most widely used technique for abstraction? Explanation: With load balancing, system requests are directed to appropriate systems on demand. 10. Which of the following is a potent cloud-building technology? Explanation: vSphere can create virtual machines, virtual datastores, and virtual networks, and move these resources about while the system is active. Sanfoundry Global Education & Learning Series – Cloud Computing. Here’s the list of Best Reference Books in Cloud Computing. 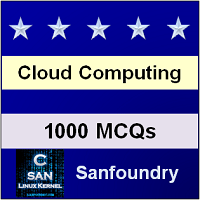 To practice all areas of Cloud Computing, Here is complete set of 1000+ Multiple Choice Questions and Answers.